Officials raid and search for suspects in Paris terror attacks. PARIS -- France identified a 27-year-old Belgian who once boasted about killing "infidels" and fought for the Islamic State group in Syria as the mastermind of the Paris attacks, and President Francois Hollande vowed Monday to forge a united coalition capable of defeating the jihadists at home and abroad. Addressing lawmakers after France observed a minute of silence honoring the 129 people killed and 350 wounded, Hollande said the victims came from at least 19 nations, and the international community, led by the United States and Russia, must overcome their deep-seated divisions over Syria to destroy Islamic State on its home turf. "Syria has become the biggest factory of terrorism the world has ever known and the international community is still too divided and too incoherent." As he spoke, thousands gathered around candlelit memorials at the Place de la Republique square and beneath the Eiffel Tower, which like many top attractions in one of the world's most-visited cities reopened for business Monday in a defiant spirit. The tower was bathed in red, white and blue floodlights of the French tricolor, with the city's centuries-old slogan - "Tossed but not sunk," suggesting an unsinkable city braving stormy seas - projected in white lights near its base. French and other Western intelligence agencies face an urgent challenge to track down the surviving members of the three Islamic State units who inflicted the unprecedented bloodshed in France and, perhaps more importantly, to target their distant commanders in IS-controlled parts of Syria. 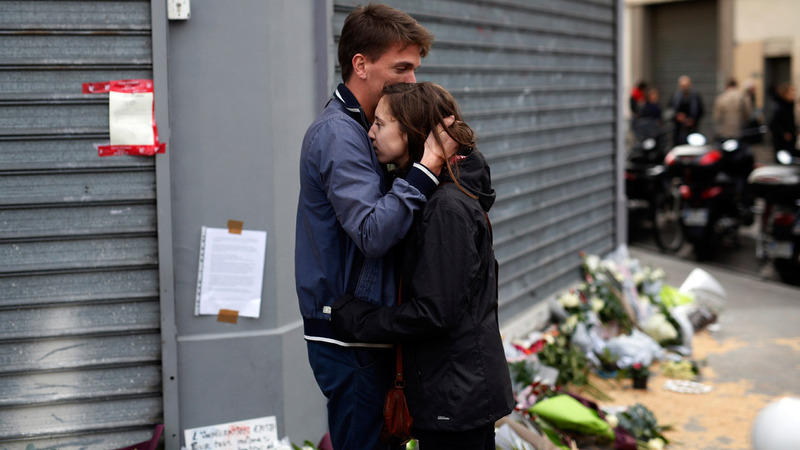 A French security official said anti-terror intelligence officials had identified Abdelhamid Abaaoud, a Belgian of Moroccan descent, as chief architect of the Friday the 13th attacks on a rock concert, a soccer game and popular nightspots in one of Paris' trendiest districts. A major action with heavily armed police is underway Monday, Nov. 16, 2015 in the Brussels neighborhood of Molenbeek amid a manhunt for a suspect of the Paris attacks. The official cited chatter from IS figures that Abaaoud had recommended a concert as an ideal target for inflicting maximum casualties, as well as electronic communications between Abaaoud and one of the Paris attackers who blew himself up. The official spoke on condition of anonymity to discuss the sensitive investigation. Abaaoud came to public attention last year by boasting in an IS propaganda video about his pride in piling the dead bodies of "infidel" enemies into a trailer. Anti-terror agencies previously linked him to a series of abortive shooting plots this year in Belgium and France, including a planned attack on a passenger train that was thwarted by American passengers who overpowered the lone gunman. French police have used emergency powers to conduct 168 searches since Sunday night that netted 127 arrests and 31 weapons. But police have yet to announce the capture of anyone suspected of direct involvement in Friday's slaughter. Seven attackers died - six after detonating suicide belts and a seventh from police gunfire - but Iraqi intelligence officials told The Associated Press that its sources indicated 19 participated in the attack and five others provided hands-on logistical support. French police accidentally permitted the suspected driver of one group of gunmen, 26-year-old Salah Abdeslam, to avoid arrest at the border Saturday and cross to his native Belgium. On Monday, Belgian police in balaclavas, gas masks and body armor raided Abdeslam's suspected hideout in the Molenbeek district of Brussels but came out empty-handed. French police launched an international manhunt Sunday, Nov. 15, 2015 for Salah Abdeslam, a 26-year-old born in Brussels. Abdeslam's brother, Brahim, was among the suicide bombers and killed one civilian after blowing himself up outside a restaurant. Police in Molenbeek arrested another brother, Mohamed, but freed him Monday without charge. After he left police custody, Mohamed Abdeslam told reporters that his family couldn't believe that both of his brothers were jihadists. He said all three siblings grew up in Belgium and seemingly were content with life in the West. "I have not been involved in any way with what happened on Friday the 13th in Paris. We are an open-minded family. We never had any problem with justice," he said. He said he didn't know where his brother Salah was or whether he would surrender to police, and expressed familial loyalty to him despite his shock over the mass killings. "You have to understand that we have a family, we have a mom, and he remains her child," he said. Determined to root out jihadists within French communities, Hollande said he would present a bill Wednesday seeking to extend a state of emergency - granting the police and military greater powers of search and arrest, and local governments the right to ban demonstrations and impose curfews - for another three months. Hollande said he hoped to meet soon with U.S. President Barack Obama and Russian President Vladimir Putin, who on Monday were attending the G-20 summit of nations in Antalya, Turkey. The two leaders maintained a publicly frosty demeanor, reflecting strained relations over Russia's support for Syrian President Bashar Assad and Russia's go-it-alone pursuit of airstrikes against both IS and anti-IS rebels in the country, a strategy that bolsters Assad. The air power of the United States, France and Britain is solely targeting IS targets. In his Versailles address, Hollande said the United States and Russia needed to cooperate in attacking IS targets "to unify our strength and achieve a result that has been too long in coming." "We are not in a war of civilizations, because these assassins don't represent one. We are in a war against jihadist terrorism, which threatens the entire world." Speaking in Turkey, Obama said the Paris bloodshed marked a "terrible and sickening setback" in the West's anti-Islamic State campaign. But he insisted his strategy of building an international coalition to launch airstrikes, while training and equipping more moderate forces on the ground, remained the best approach. He didn't comment on whether Russia should join that coalition. "The strategy that we are putting forward is the strategy that ultimately is going to work," Obama said. "It's going to take time." The Islamic State group issued a new 12-minute video Monday threatening to attack all nations involved in bombing IS positions in Syria and Iraq. One man in the video threatened to target the United States in the same style as Paris, saying that as "we struck France on its ground in Paris, we will strike America on its ground in Washington." In Paris, harrowing accounts of survival continued to emerge, particularly from the Bataclan concert hall, where three attackers shot into the fleeing crowd. Two then detonated suicide vests as police stormed the building, then fatally shot the third attacker. 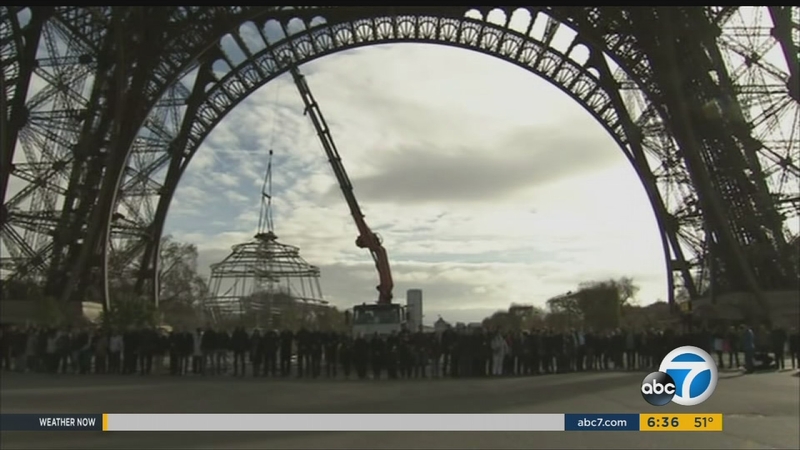 Paris remains on edge amid three days of official mourning. French troops have deployed by the thousands in support of police to restore a sense of security, but any sound of loud bangs can send people scurrying for cover. Panic ensued Sunday night as police abruptly cleared mourners from the Place de la Republique square, where police said firecrackers sparked a false alarm. Some trampled over memorial candles and floral bouquets to escape what they feared was more gunmen. "Whoever starts running starts everyone else running," said a city councilwoman, Alice Carton, who was at the square. "It's a very weird atmosphere."